E1115 F PS/2 Keyboard to ASCII Converter | Locus Engineering Inc. The E1115 F PS/2 Keyboard to ASCII Converter is a compact module for embedded microcontroller applications. It offloads the process intensive PS/2 scancode decoding from both keyboards and magnetic card readers while providing a fast single byte output response for both ASCII and non-ASCII keys including multi-media. Requiring only +5V, the easy to use module provides a pin selectable 57.6K/115.2K baud rates, Ctrl-Alt-Del and Escape key reset outputs, +3.3V@120mA regulated output, and a 100KHz clocked serial data output. The module also flashes an LED and generates an interrupt pulse. This converter allows for the quick development of any keyboard or magnetic stripe reader based project. 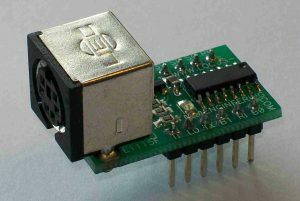 The E1115 F is available as a 12 pin DIP style 1.3″x0.7″ module. Note- as of August 2016, the E1115 B/D 10 pin DIP style models are discontinued in favor of the improved feature E1115 F model.